Is the Indian government resorting to soft censorship? Since Narendra Modi became the Indian prime minister almost four months ago, he has not interacted with the Indian media in any significant capacity — not even once, either formally or informally. This is unprecedented. Never before has an Indian leader maintained this kind of distance from the media. Additionally, Modi has given strict instructions to all his ministers and bureaucrats to avoid the media. 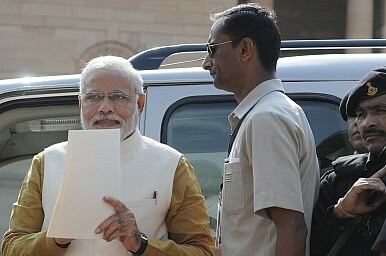 As a result, it has become difficult for many reporters to gain access to India’s government ministries. The Editor’s Guild of India also added that “a top-down, one-way interaction in a country with limited internet connectivity and technological awareness cannot be the only answer for large masses of readers, viewers, surfers and listeners. Debate, dialogue and discussion are the essential ingredients of a democratic discourse.” This statement is highly unusual and reflects the pain that the traditional media in India is facing due to the attitude of Modi’s government towards the media. Modi’s standard way of communicating with the media is either through social networking sites like Twitter or through public speeches. He has around 6 million followers on Twitter and directly communicates with them. However, it is difficult for anyone to question him. Modi does not take an entourage of journalists with him when he travels, which is a traditional practice of Indian prime ministers. His media team instead consists of handpicked print and broadcast news agencies which act more as a mouthpiece for his government than as an independent voice. Additionally, he has not appointed a press advisor to his government. By keeping the media away, Modi evades questions and scrutiny. Is this censorship and an affront to the fourth estate (the media), an important pillar of democracy? Sympathizers of the ruling Bharatiya Janata Party (BJP) argue that Modi and his ministers are active on social media and that all the information needed on the government’s actions are passed on to the media directly through social media. Therefore, the government is not withholding any information from the people. But one-way communication is different from dialogue. This is necessary for transparency and accountability. Numerous questions are difficult to ask because of the prime minister’s distance from the media. For example, why are religious tensions between Hindus and Muslims increasing in Uttar Pradesh despite Modi’s call for communal harmony? Why is the situation on India’s borders with Pakistan and China still tense despite Modi’s government’s promise to strengthen India’s frontiers? Why has the Indian government failed to introduce more drastic economic reforms despite arguing for them before the elections? Is the Indian government trying to alter school textbooks so as to make them more in line with right-wing thought? These are but a few of the questions that have arisen recently. Many argue that Modi holds a grudge against the media due to its consistent criticism of him for his handling of the 2002 Gujarat riots during his time as the chief minister of the state of Gujarat. The media kept this issue alive for over a decade and Modi feels that the media has done him an injustice by continuously harping on one incident. By not taking questions, the government is indirectly resorting to a type of censorship. The media has a very important role to play as the voice of society, so it must continue to do its job and never stop questioning. Modi does not want to have a dialogue with the press but that should not stop the press from questioning him. The fourth estate cannot abdicate its democratic responsibilities. Silencing Dissenters in India: Can the Media Fight Back? Can the Indian media take on those who'd see dissenters -- like Gauri Lankesh -- silenced?